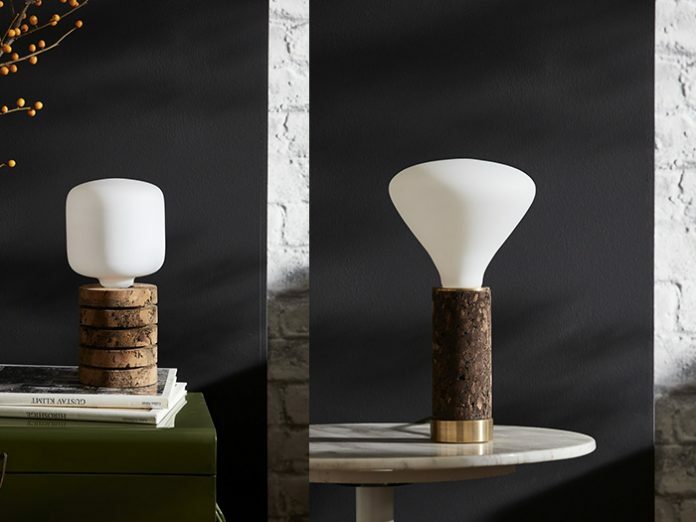 (UK) – Harmoniously fusing modern silhouettes with the patina of natural cork, Nove’s four new statement table lights include a choice of two striking styles, both available in either marbled or blackened cork finishes. The cork is carefully and sustainably hand-harvested from the self-regenerating Cork Oak tree and skilfully worked by hand to create uniquely grained cork lights. “Each of our new table lights is thoughtfully crafted from a single block of either marbled or blackened cork, which involves a skilled, labour-intensive process of precision and craftsmanship which remains at the heart of every piece we make. Our contemporary designs are further enhanced by the customisation of contrasting solid brass with chamfered edge detailing, bringing a cool, soft glow to our lamps,” said Kirsty Saxon, founder of Nove. “The new table lights collection features two unique designs; The Table Light and The Stacked Light. The Table Light features a sleek, simple column of beautiful marbled or blackened cork and is finished with an elegant chamfered, weighted solid brass base. “The Stacked Light features a wider cork base which has been hand-cut to precision to create striking, crisp, clean channels for a unique stacked effect. Again available in both marbled and blackened finishes, the Stacked Light also features a subtle chamfered brass element around the flex aperture for an extra luxury aesthetic.